Badge accessories may seem like minor details, but they are actually an excellent way to present your company ID, membership or event credentials, and they will set your company apart from the crowd. It�s only a matter of how you wear you badge. Normally, badges come attached with a variety of badge and attachment accessories. People tend to pay more attention to the details of the badges rather than on the badges themselves. At ID Security Online, we carry a wide range inventory of badge accessories in stock from badge holders, badge clips, badge reels to lanyards. Our line of accessories not only displays your ID but they also serve as a protection to your badges as well. Available in different colors and materials, you can attach your badge to your clothing with our badge accessories. Moreover, we offer free service to printing logos on your badge. You can use the logo to print on badges, name tags or promotional gear. Cleaning kits are a critical component of any ID card program. Regular printer cleanings are crucial for maintaining and extending the life of your ID card printer. 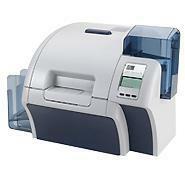 ID card printers are vulnerable for collecting dust from the ID cards. As the ID card goes through the printer they leave dust and debris that can potentially damage your printhead thus resulting ID cards with lower quality images then it would normally print. With routine cleanings and replacement of cleaning rollers, you can expect optimal image quality and a longer life for your card printer. ID card printers should be cleaned and covered when not in use. You should clean your printer every time you change your printer ribbon. Every card printer requires certain cleaning products to be used as preventive or corrective maintenance. At ID Security Online, we provide cleaning kits designed for specific ID card printers. Photo ID cameras are generally used for printing out passport style pictures suitable for your ID card. 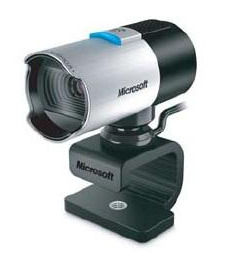 Many organizations, companies, facilities, educational institutions, medical facilities, and government offices use these cameras as an integral component to the photo ID system. A photo id requires the visual representation of the card holder on the card. There are a number of options to obtain the necessary picture to place on the current PVC card standard of today. A photo ID system is an integral component of creating an effective ID program. In our modern high tech world, photo ID cards are found far and wide with many different uses. Driver's licenses or passports are no longer the main focus for photo ID. With the sophistication and convenience of a photo ID system, companies are able to easily integrate photo ID into their organizations and enjoy the benefits they have to offer. ID badges, similar to ID cards, are used for identification purposes. Most companies, corporations, organizations, and government offices across the globe use ID cards as means to identifying their employees or citizens. ID badges are commonly worn by hospital staff, government officials, and security agents. ID badges help them cultivate a more professional, detail-oriented image for their company or organization. The Evolis Primacy dual sided printer is designed to save time and resources. This Evolis ID card printer is programmed to print on both sides of any card in just a single run. Additionally, this printer features a modular design that enables users to add encoding options at any given time as well as single or dual sided capabilities. 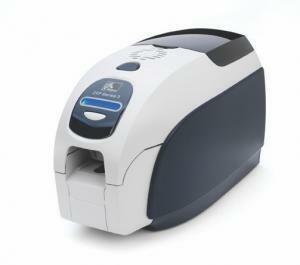 The Evolis Primacy ID card printer includes a full color or monochrome option, cost effective supplies such as a ribbon saver, and a standard USB and Ethernet connectivity. The Primacy personalizes color cards in a matter of minutes. It has the capacity to print up to 140 cards per hour on dual side printing mode. While single-sided printers generally require the user to manually flip and reload cards to print both sides, this dual-sided Primacy ID card printer can apply full color graphics, text, and other design components to a card's front and back in one quick and easy pass. Primacy is highly committed to the reliability of its card printing capabilities and guarantees professional looking ID cards. Unlike most printers, this printer also demonstrates an eco friendly element that saves energy. 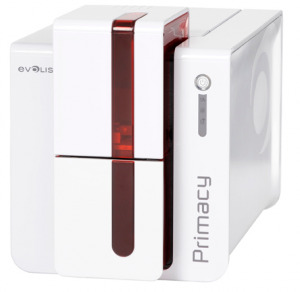 The Evolis Primacy is available in either red or blue exterior colors. These printers are ideal for high-volume ID programs, and those programs that need variable information printed on the backside of cards. Evolis� strong commitment to quality is legendary, and is echoed by a 3-year warranty. This retransfer card printer offers picturesque image quality, best-in-class throughput, a multitude of encoder options, and high reliability that minimizes maintenance. The ZXP Series 8 Printer includes ZMotif� software development tools for easy integration with enterprise applications. Using innovative retransfer printing technology, the Zebra ZXP Series 8 delivers superior print resolution at the fastest speeds in its class for high-quality photo ID cards with images and graphics that look more like glossy magazine prints than ordinary ID photos. The printer�s modular design provides flexibility to add a variety of encoding options as needed. Single or dual sided lamination is also available. This retransfer printer is ideal for printing on uneven card surfaces, such as smart cards, or for when the application calls for very high image quality or cards that are more durable and abrasion resistant. Difference between a single-sided ID card printer and a dual-sided ID card printer? A double sided printer will print on both sides of the ID card whereas a single sided printer will only print on one side of the ID card. A single sided printer is necessary for creating ID cards with limited cardholder information. It has a full color and monochrome printing capability. It offers magnetic stripe and smart card encoding options. You can choose direct-to-card or a stunning reverse transfer print technology. Printing ID cards from a single sided printer can be time consuming. 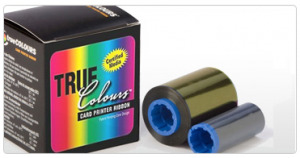 Most card printer manufactures discourage the use of a single sided printer primarily that this printer tends to damage the sensitive print heads in the print cards. Why would I need to laminate my photo ID cards? Firstly, what is a laminated card? A laminated card is a full color plastic card with Matt or Gloss lamination. Matt lamination is a thin coating on a card used to smooth out the printings on the card. This coating provides a soft and silky satin sheen high quality finish resulting in a more sophisticated card. It also allows the card to be more water resistant. It also extends the durability of your card. Gloss lamination forms a protective coating over the print which makes it suitable for items such as menus, cards, brochures etc. Gloss lamination also gives your card a more professional look. These type of plastic cards are used for advertising a business, product, or a service. Lamination serves as a protection for your card. This process is beneficial to the cardholder that it prevents the fading and dye migration via sun exposure on your card. That way, you won't have to reprint your card frequently thus saving you supply costs and time. Holographic lamination increases the security of your cards therefore preventing identity theft or unauthorized duplication of your card. How are laminated cards produced? Multiple cards must be printed on a large sheet. Then they are fed through a laminating unit which provides a thin sheet of laminate either on both or one side of the card. This procedure traps the card in between. Heat is then applied to seal the lamination. Announcing the Arrival of the Evolis Primacy! 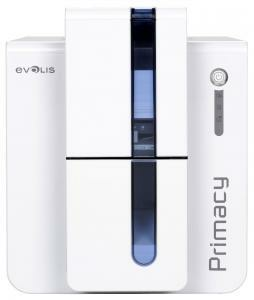 ID Security Online is proud to announce the arrival of the Evolis Primacy ID card printer! The Primacy is an easy-to-use high-end printer and the ideal solution for identification badges, payment cards, student cards and transportation passes. Available in blue and red, single or double-sided and with or without encoding technologies, the Primacy comes with USB and Ethernet TCP/IP connectivity and boasts a pioneering 3-year manufacturer's warranty. The Evolis Primacy prints a maximum of 210 cph (cards per hour) in color and 850 cph in monochrome, includes a 250-card capacity color ribbon cassette and has a 100-card capacity feeder and output hopper. Further, the Primacy is user friendly, allowing the user to check the amount of cards in the printer so that you can load more into the front panel before the printing ends. It as well highly modular, allowing you to install encoding options via the Evolis website. And for the green thumbs, Evolis Primacy has received ENERGY STAR certification, complies with ErP directives and consumes an average of 5 times less than earlier printers. At ID Security Online our goal is to make it easy for you to search through our database. Let�s face it, we�ve designed it so we know where everything is, and in order to allow you to find what you need quickly and easily we�ve added website tools to make it that much easier to find what you�re looking for. You can search for supplies in one of four convenient ways. If you�re a digital camera enthusiast, or otherwise possess an interest, in or need of, image device technology (such as scanners) the more likely than not you�ve run into the word TWAIN. What�s more is that you might be one of the many people who don�t actually know what this word means, but given its common appearance in reference to such devices you probably assume that it�s important. An ID card printer cleaning kit is a grouping of items specifically for the intent of maintaining your printer. Virtually all high end ID card printer manufacturers, such as Evolis, Magicard and Zebra, provide their clientele with proprietary variations of cleaning supplies contained within comprehensive cleaning kits.